I create two styles of work: furniture inspired by objects, and furniture inspired by photographs that I take. 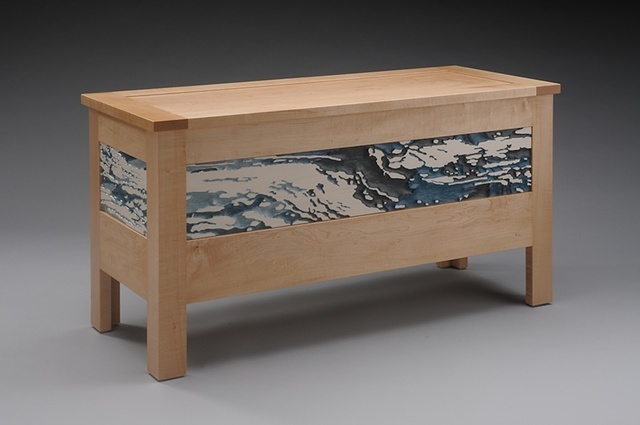 Each mode of work serves a utilitarian purpose (with some exceptions), such as a coat rack or blanket chest. The basic forms of Early American folk art serve as inspiration for my object-inspired work. I combine several construction methods, from mortise and tenon, metal work, and turning, to both hand and machine shaping. “Autumn” is in the form of an old wooden rake and serves a similar purpose to a Shaker pegboard.